Occupational Physical Activity and Body Mass Index (BMI) Among Canadian Adults: Does Physical Activity at Work Help to Explain the Socio-economic Patterning of Body Weight? Le computer-tailoring: solution potentielle pour optimiser les pratiques cliniques préventives de counselling en milieu clinique? Re: Outram SM. Epidemiology and Bioethics: A Plea for Reconnecting With the Public. 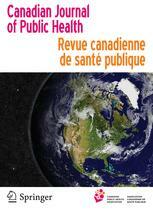 [Ethics in Public Health] Can J Public Health 2011;102(1):4–6.